Kotelnikov is my latest product: a digital voltage controlled wavetable oscillator module with morphing feature and built-in transient generator available as DIY kit. 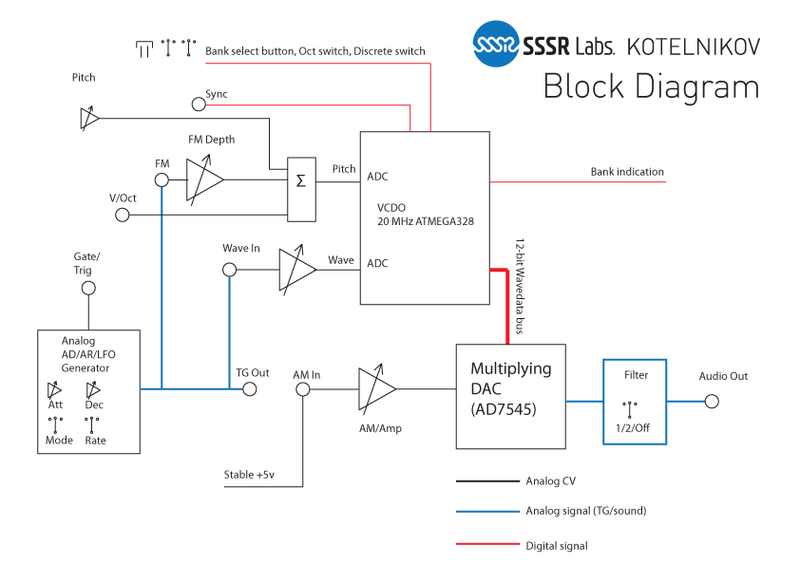 This oscillator can generate number of sounds with diverse spectral content and combine them in various proportions. 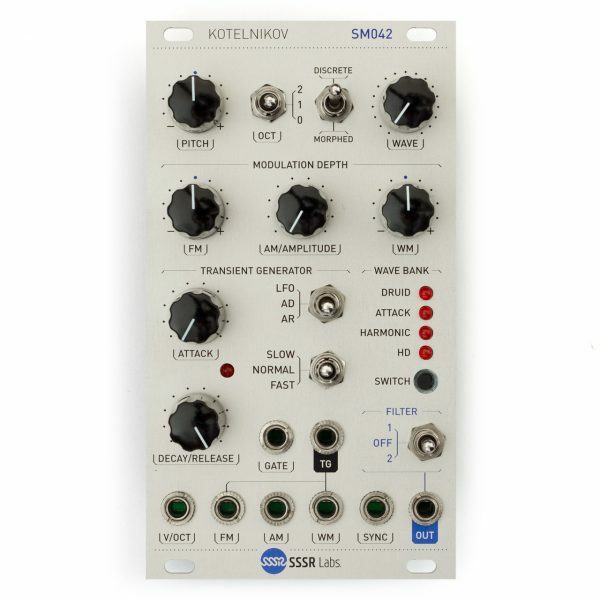 Kotelnikov can be used as a usual oscillator in a traditional subtractive synthesizer system, but it is also possible to use it as a complete voice module as it features shaped timbres, envelope generator and amplitude modulation. The sound engine sampling rate is locked to pitch and varies from 4.2 to 133 kHz, which gives very clear highs and uniform spectral content over the full range. The Pitch resolution is 6 cents and CV input sampling rate is 6 kHz, which gives smooth analogish FM-ready CV response. Analogue Amplitude Modulation input is bipolar, linear, rail-to-rail. The firmware is written in Assembly language to ensure glitch-free operation and maximum working range. The Transient Generator has 3 modes: AD/AR envelope generator or resettable LFO. Total time range of 0.4µs–10s is divided into 3 subranges. This generator is internally connected with FM and WM inputs, which helps you to achieve fluent, alive sound with no wires at all. Wavetables: 3x16 8-bit tables, 32 12-bit tables. 256 samples each. Thing looks killer any hope for a PCB/panel version in the future? I have a policy to only ever use my own parts nowadays. The parts list looks pretty esoteric -- Russian switch IC? I'm curious about what parts are done in software vs. hardware. Any chance of a schem/block diagram? The switch IC is needed for the Transient Generator. Unlike CD4066 it is close equivalent to a MAX analog switch, which is simply cleaner, faster and has separate V+ for logic and signal. A new demo with manual scanning through Kotelnikov's wave forms in all 4 banks. No processing, no editing, no effects. Recorded through a transformer direct-box, so certain ultra-low frequencies might disappear. I've been using this oscillator a lot more lately and I gotta say....it's really nice in both sound and functionality. Harmonic mode rocks. This was one of the best and hassle-free builds I've done. Well-documented, no surprises. I've build the minimal kit and thanks to the good build instructions i've had build the thing in no time. I really enjoy the module. The only issue i've encountered is, that the LFO only retriggers when the decay time is set to very fast (switch set to fast mode and pot is dialed less than ~2o'clock). On different settings, it retriggers sometimes 3-4 times but normally just behaves like an AD. Its likely that i've used some wrong/faulty component somewhere, but before i randomly replace parts, i thought maybe you can give me a hint which components might cause that behavior? Thank you! Just finished my build yesterday. Sounds absolutely great, and ridiculously fun! Hadn't anticipated how much fun drums with this thing could be too! Hello. I just finished building your Kotelnikov kit and it keeps burning out IC13 as soon as I power up with the knobs and switches set according to the build document for the power up test. I've looked it over and everything looks good. Can you help me with my issue. Thank You. Hi! Please send me a pictures of your build to sssrlabs@sssrlabs.com. Usually it can happen due to mixed up power pins. I bought a kit from Synthcube and there was a few strange things there.. Instead of two 130K and two 150K resistors there were two 13M and two 15M resistors. I would guess the correct values to use is 150K and 130K? And I'm not sure if two of the capacitors are correct either. Anybody else had kits with wrong componenets? 13M and M13 are not the same! In that package you can also find 100K 0.1% soviet resistors labeled as "M1 0.1%"
I'm also not totally sure about two of the capacitor values, there's a big one that looks like a ceramic one, but that's the mylar 3n3 isn't it? I'll have to get back later with this question as I don't have it here right now.. The last of the blue ceramic capacitors supplied in the kit is labeled 331, that's a value of 330 pF. Is it OK to put it into C35 even though it's supposed to be 300pF? Absolutely. It's 10% or even more tolerance anyway. the pitch pot is working only when i turn it to mid-high positions(one step after the center).. looks like something curious.. isn't it? Probably that was you asking the same question by email. I've just replied about 10 minutes ago and will also reply here. It has only 1 ADC input for the pitch, so all pitch and FM-related controls go to an analog summing stage and being acquired at the same time with the maximum range of 0–5.000V equivalent to exactly 5 octaves. (This ensures the perfect tracking) So, when all inputs are at 0V, the Pitch knob is intended to have the minimum value with the low-C at the center position. As more voltage is applied to the V/Oct input, knob starts to work in full range. firstly thanks for double answers and secondly for this little terrific(and well documented) device! now i got a doepfer midi cv interface (version 3) and started to send gate/pitch from an elektron monomachine..
within this setup i always get sound from the module even when i stop playing notes, the module keep on playing the last note/pitch triggered. so I don't get what shown on your modulation video above! i know monomachine is not what can be called as the "usual" midi keyboard, this was actually the first time i was using its midi output..
You just need to connect TG output to the AM input to achieve what you want. ok, good to know, now i get it! Lovely sounding device from the demos. I like the way it can be so smooth and musical. I really like the design too - stylish but also a practical layout. 1. instead of C24 1n ceramic I got a mylar/film-looking (blue) one with the same value, 1nF. I guess it's no big deal, just noted. 2. C30 & C31 are supposed to be 22p, the ones I got are marked 220. Can I still use them?